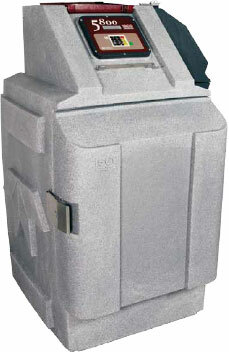 Isco 5800 Refrigerated Sampler - Gripp Inc. The 5800 sampler uses Isco’s proven peristaltic pump for superior performance and volume accuracy. The pump revolution counter and liquid detector deliver samples at USEPA recommended and ISO standard line velocity of at least 2 ft/s (0.6 m/s), even at head heights up to 25 ft (7.6 m). Pump Tubing Bands keep the tubing in place to ensure pumping performance and sample volume delivery. Sample volume accuracy is guaranteed with the Pump Revolution Counter. The Liquid Detector notifies the controller when liquid is present for precise line rinsing and elimination of missed samples. For more information, download the Isco 5800 Refrigerated Sampler Brochure PDF.